Smith, L. Neil. 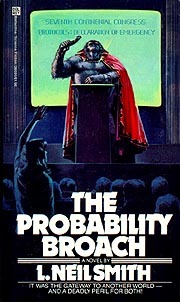 The Probability Broach . Ballantine/Del Rey 1980. What if: A one-word difference in the Declaration of Independence resulted 18 years later in Albert Gallatin supporting the Whiskey Rebellion rather than trying to defuse it. Subsequently, George Washington was executed and the U.S. Constitution was revoked. Series note: Tales of a detective and descendants in a libertarian North America. In internal chronology they are The Probability Broach , "The Spirit of Exmas Sideways", The Nagasaki Vector , The American Zone , The Venus Belt , The Gallatin Divergence , Tom Paine Maru , Brightsuit MacBear , and Tyflak Lysandra . The latter two or three volumes are only marginally allohistorical. The first volume has also been published in graphic novel format. Summary: In 1987, a Denver cop investigating a scientist's murder crosses timelines and finds himself in a Libertarian utopia, but one threatened by a Hamiltonian plot. Series note: The first North American Confederacy story. Published: Ballantine/Del Rey 1980 (034528593X); and exp. Tor 1996 (0812538757BUY), 2001 (0765301539BUY). Summary: Graphic novel based on the original novel by Smith. Series note: Graphic version of the first North American Confederacy story. Published: Big Head Press 2004 (0974381411BUY). Smith, L. Neil. "The Spirit of Exmas Sideways"
Summary: In 1988, Detective Bear investigates another murder involving the crosstime machine. Series note: The second North American Confederacy story. Published: In Alternatives (eds. Robert Adams and Pamela Crippen Adams), q.v. Series note: Third in the North American Confederacy series. Published: Ballantine/Del Rey 1983 (0345303822BUY). Published: Fix-up novel made up of three shorter works: f 1) "Grimm's Law", in Stellar #5 Science-Fiction Stories (ed. Judy-Lynn Del Rey), Ballantine 1980; 2) "Folger's Factor", in Stellar #6 Science-Fiction Stories (ed. Judy-Lynn Del Rey), Ballantine 1981; and 3) "Grandfather Clause", in Stellar #7 Science-Fiction Stories (ed. Judy-Lynn Del Rey), Ballantine 1981 (0345294734). Smith, L. Neil. 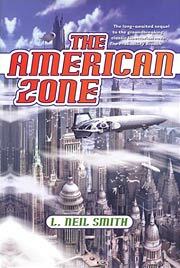 The American Zone Tor 2001. Series note: Fourth in the North American Confederacy series. Published: Tor 2001 (0312873697BUY), 2002 (0312875266BUY). Summary: In 1999, with friends and relatives mysteriously disappearing, Bear is off to the asteroid belt to investigate a crosstime Hamiltonian plot. Series note: Fifth in the North American Confederacy series. Published: Ballantine/Del Rey 1981 (0345287215BUY). Summary: Detective Bear travels back in time to 1794 to save the founder of the North American Confederacy from assassins. Series note: Sixth in the North American Confederacy series. Published: Ballantine/Del Rey 1985 (0345303830BUY). Summary: The story of the first Confederacy starship. Series note: Seventh in the North American Confederacy series. Published: Ballantine/Del Rey 1984 (034529243XBUY). Series note: Eighth in the North American Confederacy series. Series note: Ninth in the North American Confederacy series.